For more than four decades at the UW Libraries, Karyl Winn preserved the significant papers and effects of some of our region’s most important figures. Karyl Winn was a giant in preserving history. Scholars, historians and anyone else who wants to learn about Sen. Henry M. Jackson’s time in Washington, D.C., should take a moment to appreciate and remember Karyl Winn, ’77, who died May 20 in Seattle. Because of her diligent efforts as the UW Libraries’ Curator of Manuscripts, the public can review the papers of Jackson, ’32; the papers of Sen. Warren Magnuson, ’29; the Cannery and Farm Laborers’ Union in Seattle; and those of Tyree Scott, an African American activist who worked to integrate Seattle’s labor unions and secure contracts for African American contractors. These are just a fraction of the projects Winn, who died in May, worked on during her 42-year-long career at the UW. In fact, if you do a Google search of “Karyl Winn,” you will come across a long list of people and organizations who thank Winn for her contributions: The Mountaineers, for her work helping compile a history of the 100-year-old organization; Dana Frank, for providing access to papers for her book “Consumer Organizing, Gender and the Seattle Labor Movement”; UW History Professor John Findlay, for help on his book, “Atomic Frontier Days: Hanford and the American West”; Bonnie Sue Lewis, for her assistance in authoring “Creating Christian Indians: Native Clergy in the Presbyterian Church”; and the list goes on. For more than four decades at the UW Libraries, Winn preserved the significant papers and effects of some of our region’s most important figures. If you wanted source material on a historical figure or topic but didn’t know where to look, Winn could find what you needed. She also helped fellow library staff prepare papers for researchers to use. Winn also played an important role in the Society of American Archivists, founding the Washington chapter of the organization. She was also involved in almost every important archivist and historical organization. Her peers in the U.S. and Canada deeply admired and respected Winn for her work. But Winn’s interests in life far exceeded her curatorial work. She was a huge fan of Seattle theater and held season tickets to the Seattle Opera for 49 years. 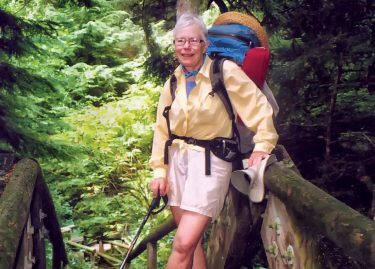 With her husband Norman, she loved to get outdoors to climb and hike the mountains of the Pacific Northwest. The couple also added sea kayaking and bicycle touring to their repertoire. Her love of nature fueled her activism in the environmental movement. Winn served as a trustee for the Alpine Lakes Protection Society. When Winn retired from the UW, she didn’t downshift into a more sedate lifestyle. She spent even more time in her beloved garden, served as a docent at the Volunteer Park Conservatory, traveled extensively, and audited history classes at the UW so she could learn more about other regions of the world. Colleagues at UW Libraries held Winn in high regard, not just as a professional but as a friend. The city, the university and the state of Washington lost a citizen of the world on May 20, but she left a legacy that many will remember.